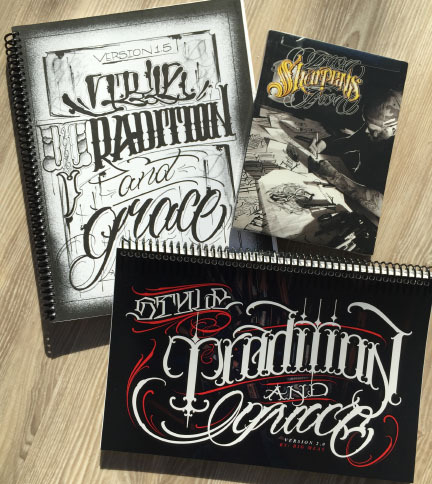 Two Great Lettering Books from Big Meas! Recently we added a video from lettering Maestro Big Meas, Iron Sharpens Iron, which has proved to be a breakthrough tutorial for artists wanting to explore lettering more deeply. 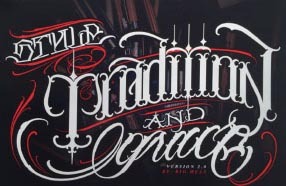 It's a compact video, jammed with information about different lettering tools, fitting lettering into a flowing body part, and understanding what makes different fonts work, along with some technical tips on tattooing lettering. We've been impressed enough with the DVD that we've also stocked Meas' two books: Style, Tradition and Grace versions1.5, and Style, Tradition and Grace, version 2.0. These books are the perfect compliment to the DVD and provide numerous examples of different directions that you can take your lettering, including not only effects and flourishes but a number of entire alphabets. Since lettering in tattoos seems to have an enduring appeal that will likely always have a place in the profession, Big Meas' material is a sound investment into bringing your practice up to date with the needs of the modern tattooist. If you want to order all three, you can save on shipping by opting for the Big Meas combo pack, which includes both books and the DVD. Highly recommended, and a great reference addition for your studio. Available now at the Tattoo Education online store!